Indor made the remarks in an interview with Arutz 7. The German negotiator mediating between Hamas and Israel on a prisoner exchange deal has demanded from all sides involved – Israel, Egypt and Hamas – not to leak any details about progress made in the negotiations to the media, high-ranking Palestinian officials told London-based Arabic-language newspaper al-Quds al-Arabi. The newspaper reported Friday that the German mediator was firm in his demand, noting that leaking any information to the media will make his quit his mediation job. The same sources added that all the information on the matter being published by Israeli, Palestinian and foreign media outlets was “far from reality” and that no one really knew what was happening behind the scenes of the negotiations. The same sources implied that progress had been made in the negotiations, but refused to elaborate. They also noted that the Germans had stressed that when they mediated between Israel and Hezbollah in last year’s prisoner exchange deal, it was done under complete secrecy due to the German mediator’s demand. The Germans had added that they believe the negotiations between Israel and Hezbollah succeeded and the swap deal was implemented because of the sides’ commitment to maintain a blackout during the talks. The same sources denied a connection between Hamas politburo chief Khaled Mashaal’s trip to Egypt and Prime Minister Benjamin Netanyahu’s visit to Cairo this week, adding that contrary to a report by the al-Sharq al-Awsat newspaper, Netanyahu and Egyptian President Hosni Mubarak are not expected to declare that the sides have reached an agreement any time soon. The sources also reported that the Egyptians had asked Hamas leaders not to reveal any details of the negotiations, following an official request made by the German mediator. The debate surrounding the release of Hamas prisoners in exchange for captured Israeli soldier, Gilad Shalit, took another form Thursday morning as holiday parcels for prisoners were passed over the border. 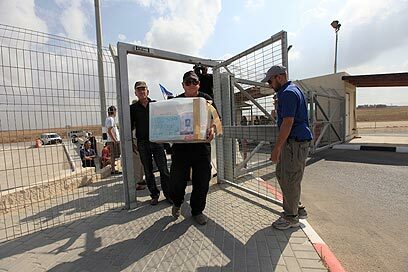 Israel Prison Service officials delayed transferring the parcels from the Gaza Strip to Palestinian prisoners jailed in Israel at the behest of the Organization of Victims of Terror in Israel. Noam Shalit, the kidnapped soldier’s father, arrived at Erez Crossing Thursday together with members of the Shalit campaign, most of them from the Kibbutz Movement, in order to hold a ceremonial holiday parcel exchange across the border. A parcel put together especially for Gilad Shalit was sent over the border to the Gaza Strip after it made a long journey throughout Israel, including to the Western Wall. In exchange, family members of Palestinian prisoners sent over 100 parcels intended for their loved ones in Israeli jails. The Israeli activists were ordered by defense officials to leave the area after receiving alerts about potential shooting attacks from the Gaza Strip. This, however, was not the only issue overshadowing the mutual goodwill gesture. After the parcels were swapped, the Organization for Victims of Terror in Israel submitted a request to the IPS to prevent the parcels from being passed on to the Palestinian prisoners. IPS officials notified Yoel Marshak, who chairs the Headquarters for the Release of Gilad Shalit, that they could not give the prisoners their parcels until the issue was sorted out. The haredi community in Jerusalem also enlisted in the fight for Gilad’s release. Haredi media outlets published calls Thursday “to pray for the wellbeing of Gilad son of Aviva,” in hopes for his speedy release. Sources within the haredi community noted that this effort is the counterpart to the Gilad’s Army of Friends internet campaign, but that the haredi version is being carried out via telephone for halachic reasons. Terror victims’ activist congratulates security forces on the re-arrest of 5 Fatah terrorists – and asks why they were released in the first place. Israel’s Terror Victims Association “Almagor” congratulated the nation’s security forces Tuesday on their re-arrest of five dangerous Fatah terrorists – but asked why they were ever released in the first place. The IDF announced Tuesday afternoon that during July and August, it arrested five terrorists known as the Tanzim – members of Fatah’s militant wing – from the village of Silwad near Ramallah. The arrests were carried out in conjunction with the Israel Security Agency (Shin Bet). The terrorists are responsible for having carried out a number of terrorist attacks in and around Highway 60, the main north-south route in Judea and Samaria, according to the IDF Spokesman. On July 9, around 6:00 in the morning, two of the arrested men attempted to murder the passengers of an Israeli vehicle traveling near Silwad. They fired shots at the car, but no one was hurt. Dozens of Israelis have been murdered in similar roadside shootings over the past several years. After an initial investigation, security forces arrested gunmen Maharan Iad and Tzalach Chamed, and later Mustafa Chamed. All three have been arrested in the past for their active participation and membership in a Fatah group known for violence against Arabs suspected of cooperating with Israel. Iad admitted to planning the attack with the other two over the course of a few days, during which they looked for the optimal location to carry it out. The investigation also showed that both Mustafa and Tzalach were involved in at least one shooting attack in the area during 2005. Two additional Tanzim operatives, Jamil Chamed and Rami Chamed, were also arrested during the course of the investigation. The two men admitted to active participation in a number of terror attacks during the years-long terrorist war that began in 2000. Almagor to Justice Minister: Why Were They Released? Israel’s Terror Victims Association released this announcement: “We have asked the Justice Minister, Yaakov Ne’eman, to publicly reveal the circumstances under which these terrorists were previously arrested, and how and why they were released. Pictures superimposed faces of female Palestinian suicide bombers on Madonna-and-child paintings. The Israeli journalists’ union on Thursday took down a series of pictures that superimposed the faces of female Palestinian suicide bombers on Madonna-and-child paintings after the images sparked a public furor. Yossi Bar-Mocha, the head of the National Federation of Israeli Journalists, said his organization removed the pictures from its Tel Aviv headquarters for fear they would offend people who lost relatives in militant attacks. “There is a majority in favor of removing the pictures … The main problem is that the artists didn’t tell us what the exhibition was about beforehand and simply presented it as ‘an exhibition of pictures,'” said Bar-Mocha. One of the artists, Galina Bleikh, said their intention was not to glorify or justify the bombers’ actions. She and her partner, Lilia Chak, tried to address a subject that pains the whole country in the exhibit, titled Woman, Mother, Murderer: An Exhibit on Female Terror, she explained. “How can a woman who comes into the world with the role of loving and giving life become a source of hatred and murder?” Bleikh added, speaking before the pictures were taken down. Neither of the artists could immediately be reached afterward. The seven canvases, part of a larger exhibition, splice the bombers’ faces onto works by Botticelli, Raphael and other eminent artists. Bleikh told The Associated Press that the show’s concept was sparked by a suicide attack near her Jerusalem home carried out by a female bomber. That message did not filter through to some of the politicians and relatives of terror attack victims who objected to the works. The art display was to open without the seven contentious pieces on Thursday night. Lawmaker Yochanan Plesner of the Kadima Party called the exhibit a despicable public relations ploy. Almagor, an Israeli organization representing victims of militant attacks, said the paintings glorified the bombers. “These pictures will become a hit in the Arab world,” said Dr. Aryeh Bachrach, head of Almagor’s bereaved parents forum. “Depicting Palestinian women murderers as saints is an important propaganda achievement for terror organizations,” said Bachrach, whose son was killed by Palestinian gunmen while hiking in the West Bank in 1995. Journalists’ union head Bar-Mocha said he was unaware of the pictures’ content ahead of time and after consulting with board members and legal counsel, decided the sensibilities of terror victims’ relatives trumped concerns over freedom of expression. “If I must hear the cries of the bereaved families who lost their loved ones at the hands of these murderers, then I would favor them over these murderers and the images that are depicted as Christian saints,” he said. The uproar was reminiscent of a controversy that arose in 2004 in Sweden after an Israeli-born artist mounted an installation showing a small ship carrying a picture of a female suicide bomber sailing in a rectangular pool filled with red-colored water. The artist, Dror Feiler, said the piece was mean to call attention to how weak, lonely people can be capable of horrible things. But the then-Israeli ambassador to Sweden, Zvi Mazel, said the exhibit glorified suicide bombers and he threw a spotlight at the installation, trying to damage it and causing a diplomatic flap between the two countries.